Historically, residential development in Florida has included construction of 18-hole, 100+-acre golf courses to attract new home buyers. Once communities are fully developed and subsequently sold out, continued operation of the golf courses over the long term is financially difficult due to high maintenance costs. Maintenance of sensitive turf grasses requires continual application of fertilizers, pesticides, and herbicides. In older golf courses, chemical residue in soil and groundwater can build to such levels that costly environmental remediation is required for redevelopment of the land. The Village of Royal Palm Beach, in Palm Beach County, Florida, was faced with such a golf course redevelopment challenge. In 2003, the Village purchased a bankrupt, abandoned golf course in the heart of its community with 36,000 residents in surrounding homes. The Village created a master plan to transform the 163-acre, derelict, and overgrown golf course into a regional recreation park with trails, sports facilities, playgrounds, pavilions for picnics and social gatherings, and a lake for kayaking. The design team, which was led by Erdman-Anthony (Ms. Dana Gillette, P.E.) and included Dunkelberger Engineering and Testing, Inc., A Terracon Company (Terracon), as a sub-consultant to assist in addressing the anticipated environmental problems and help deliver a safe regional park within an established budget and without impact to adjoining, privately-owned properties. 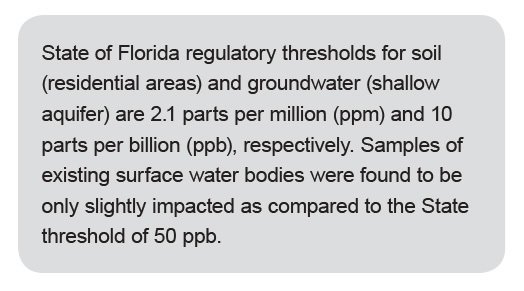 Terracon’s site assessment confirmed that the green grassy expanse contained troublesome amounts of chemical residue (arsenic, dieldrin, and toxaphene) in the top 24 inches of soil and also in the shallow groundwater. The soils were chemically impacted in the raised tee box and putting green areas while groundwater impacts were pronounced in lower-lying fairways that tend to accumulate surface water runoff. The heavy metal arsenic was the more prevalent chemical constituent and was measured by Terracon, through a program of field sampling and laboratory analysis, at concentrations up to 12 part per million (ppm) in soil and 110 parts per billion (ppb) in groundwater. Development of a site-specific threshold at 5.5 ppm for arsenic-impacted soil, defined as a safe exposure level by the toxicologist. Excavation of the 20-acre kayaking lake in an area of more severe groundwater contamination to form a surface water body involving a less stringent regulatory criterion (50 ppm versus 10 ppm for groundwater). Relocating the more contaminated soils (greater than 5.5 ppm) from tee boxes and greens to a landscape area where they were covered by an impervious liner and a three-foot-thick surface layer of soil. Removal and landfill disposal of a small amount (i.e., less than 200 tons) of chemically impacted soil located at a “hot spot” at the golf maintenance facility. Establishing a safe site-specific soil clean-up target level, which is commonly known as SCTL, at 5.5 ppm significantly reduced the area of the site requiring remediation. Containing the more contaminated soils on-site beneath the cap system minimized the volume, and cost, of off-site disposal of soil. Terracon provided construction observation and testing services to verify compliance with the regulatory approved soils management plan. A further challenge during construction involved dewatering of the kayaking lake as part of its construction. Dewatering effluent was directed to a centrally located, above-ground impoundment where it was sampled and tested by Terracon. Water meeting the 50 ppm arsenic criterion was then allowed to flow into the newly constructed lake or into off-site canals. The park opened in the spring of 2013 to a crowd of 40,000 people, and it is flourishing as a popular regional attraction. Terracon’s post-construction services involve carrying out a State-approved monitoring plan, over a five-year period, to test groundwater beneath the site and document its improvement in quality through natural attenuation of arsenic concentrations. The environmental problems associated with redeveloping old golf course sites can be monumental. 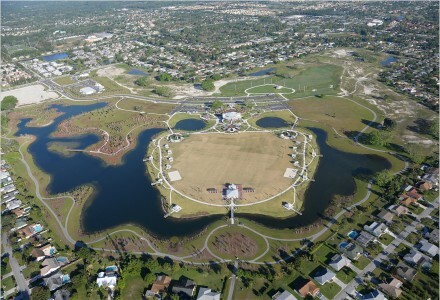 The Village of Royal Palm Beach park project is a great success story of practical problem solving, by a properly engineered balance of safety and cost, allowed by a cooperative partnership of an owner, engineers, and regulatory agencies.